Or, "Welcome, (to the) family!" For those of you who read the posts on the day of publication and don't go back to check on later comments (for shame! ), you might want to take a look here (2/3 of ALG's family chimes in about International Women's Day!) and here for some interesting comments. I find the first series of comments particularly interesting, as they were posted exclusively by members of my family, and you can see certain family dynamics at play among our insightful conversation. This amuses me. It also amuses me that my brother thinks that women are inherently better teachers and men are inherently better CEOs, while I...don't. P.S. Photo above is from 1984. Since I didn't ask permission to post, I partially blurred it to protect the identities of anyone who was over the age of 20 in 1984. 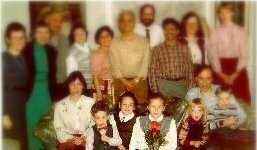 Yes, yes, parents, aunts, uncles, and grandma--you all look just like you did in 1984, which is why I had to blur the photo to protect your identities!